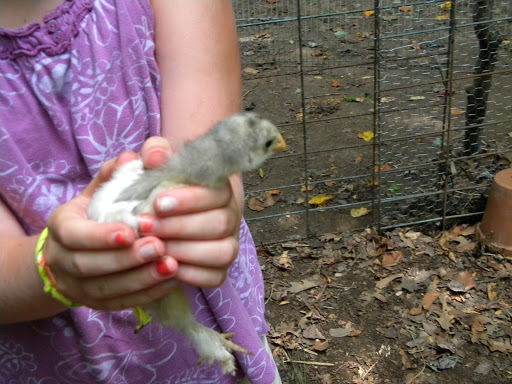 We are down to nine chickens, from a dozen last fall. Kramer, of the criss cross beak went first. We were surprised she lasted as long as she did. As she grew, her beak got progressively worse and there was really nothing to be done about it. She was half the size of the others, but definitely had the strongest personality. She often wandered away from the rest of the flock, just doing her own thing. She was quite fearless. Ultimately though, she just wasn’t getting enough food to sustain her. 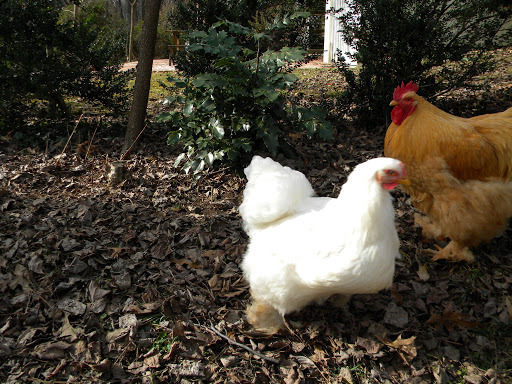 Butters, the large Buff Cochin rooster, was sent to the farm to live after he started turning a little ornery and chasing people. 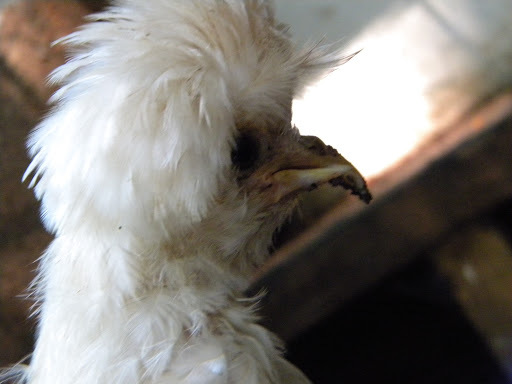 Cuddles, aka, Rosebud aka Ruby aka Diana, the little soft grey chick that struggled along, then turned into a big, beautiful, white fluffy White Cochin, passed away after taking sick during that bitter cold stretch we had in January. She was everyone’s favorite, hence all her names. When Brian came over to tell us, he was a little upset. Edie was upset too when we finally broke the news to her. Not as upset as when she learned about Kramer, but still sad. I suspect Ozzy misses her too. 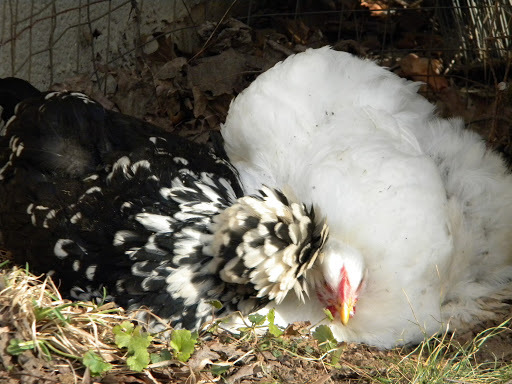 I got a whole set of shots of those two snuggled up just a few weeks ago, as they appeared to be chatting under the back porch. Well, maybe not chatting as much as Ozzy walking over and resting her head on top of Cuddles, appearing to console her. Looking at these now, I wonder if Cuddles was ill back then and Ozzy knew. Owlface appears to be our best layer, laying at least one green egg a day for us. Although Ozzy isn’t too far behind. 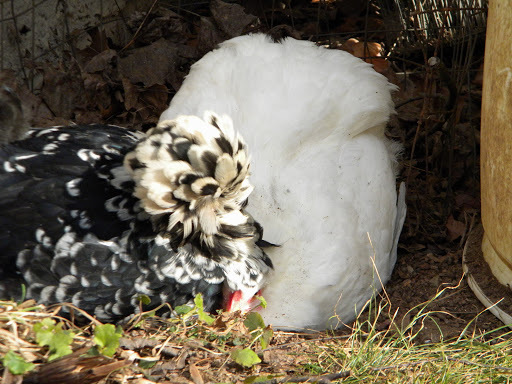 Ozzy continues to be our funky chicken, with her lopsided crest that hangs over one eye. I think she’s a Houdan breed, which is originally from France. 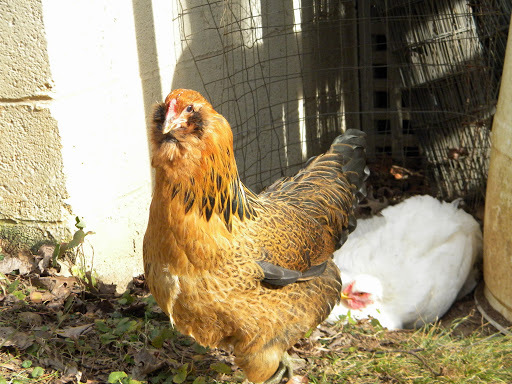 She is hands down, Edie’s favorite chicken of them all and with the loss of Kramer & Butters, she’s now the first chicken to come running out to greet whatever human she sees. 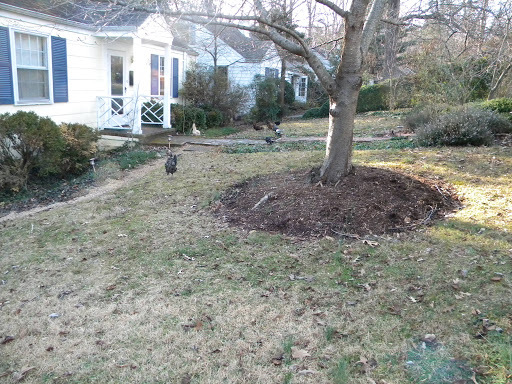 Their house is down at Brian’s, two doors down and yet they wander over to our yard daily. It’s uncanny how they know who feeds them. 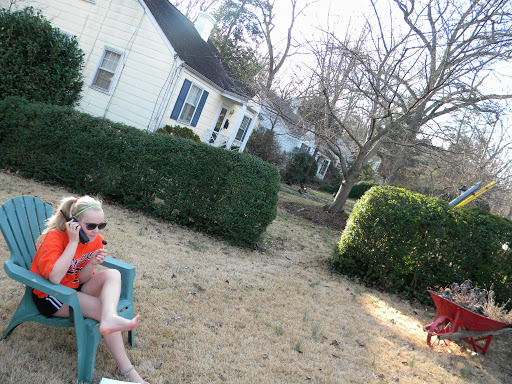 During a warm spell last week I tried to capture the sights of the front yard – Edie plopped in the front yard, talking on the phone while supposedly doing her homework, meanwhile the chickens wandering about. 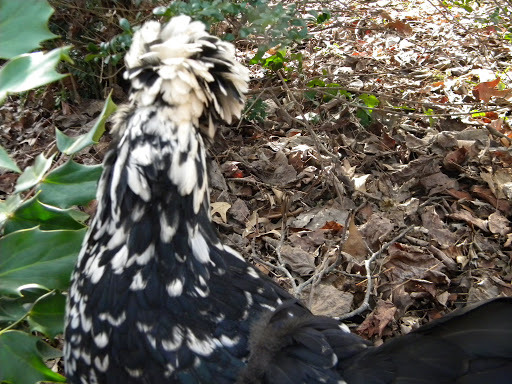 I think it's hilarious that your rooster was chasing people! 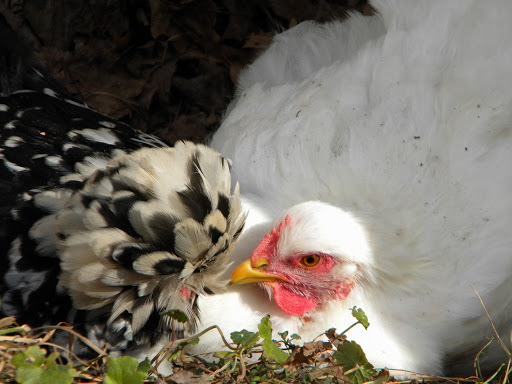 We had a cross-beak chicken and fed her thawed frozen corn when we couldn't get fresh(or it was too expensive). 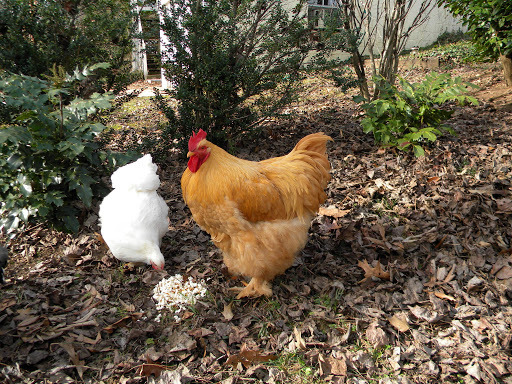 She couldn't manage dried corn, scratch, etc., but she was a hen of privilege and did not share her special corn. They are so pretty-not at all like my grandmother's chicken. But then again I never really looked at them because I was always running from them! 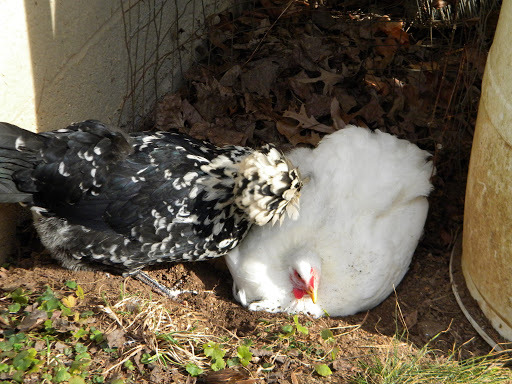 I love all the cool names of your chickens; it shows they're loved! They start to get aggressive as they mature – protecting their territory. They just so happened to arrive just as school let out, so the kids played with them every day and named them as they went along.